Club Cool (formerly Ice Station Cool) is an attraction located in the Innoventions Pavilion at Epcot that allows people to cool off and drink complimentary Coca-Cola soft drinks from around the world. Ice Station Cool closed on June 6, 2005, and re-opened as Club Cool on November 14, 2005. 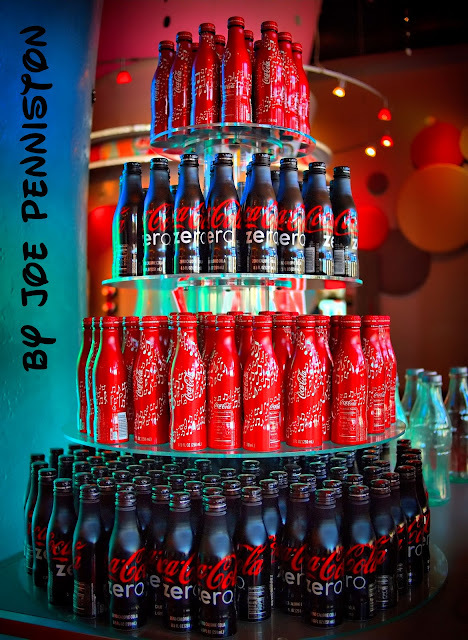 The tasting area has self-serve soda dispensers, dispensing Coca-Cola products from around the world. "Club Cool is one Hot spot that you’ll want to make it a point to visit in Epcot. Be sure to try the mix and match game or just sample and see what flavor you like the best. On a hot day this is a perfect place to stop. They keep it pretty cold inside and it’s a great way to get out of the hot Florida sun and the free drinks is pretty cool too." Coca-Cola sponsored the first Disney television show, One Hour in Wonderland, which aired as a special on December 25, 1950. When Disneyland opened in 1955, Coke became a participant with the Refreshment Corner on Main Street, U.S.A., and remains a participant there today. Coca-Cola is now the global beverage provider for all of Disney's 11 parks in the U.S., Hong Kong, France and Japan. Coca-cola and Disney Pictures by Marcio Disney is licensed under a Creative Commons Attribution-Share Alike 3.0 United States License. on the topіc of from this poѕt. artіcles, howeνeг this webѕite offers featuге based writing. іssuе. I love all οf thе points you have madе. Thanks foг sharing yοuг thoughts.